Why shouldn’t he be? His third album – World on Fire, the second featuring Myles Kennedy and the Conspirators – was a Billboard #1 US Top Hard Rock Album. Tours worldwide have been generally sold out. Throw in the release of live album, Live at the Roxy 9/25/14, and you have one happy guitar dude. In fact, as long as you stay away from mentioning a certain band called Guns N’ Roses and his impending divorce, the sky’s the limit, at least for the allotted 10 minutes. Despite several hit albums that followed – GN’R Lies, Use Your Illusion Volumes I and II, and The Spaghetti Incident? – drugs and inner band turmoil took their toll on the group. Stradlin left in 1991 and Slash – despite having Slash’s Snakepit as a side-project – chose to leave the band in 1996. In 2002, Slash, along with vocalist Scott Weiland, McKagan, rhythm guitarist Dave Kushner, and second Guns N’ Roses drummer Matt Sorum, eventually evolved into what was to become Velvet Revolver. Velvet Revolver, most noted for the hit single “Fall to Pieces,” was later shelved with an uncertain future when Weiland’s apparent drug issues interfered with the band’s activities. This gave faithful Guns N’ Roses fans hope that a potential reunion with the original lineup was in the works. The years following Slash’s departure, however, saw the guitarist and Rose publically vilifying each other in the press. Slash even stated before the band’s induction into the Rock and Roll Hall of Fame in 2012 that Rose “hates my guts” while Rose commented, among other things, that the guitarist was trying to sabotage his health by forcing him to tour against his will. Recent rumors have been circulating that the guitarist and mercurial singer Rose have mended fences, leading once again to whispers of a reunion of the band. Slash, however, sidestepped the forbidden question and quickly gave credit to Alter Bridge frontman Kennedy, who was originally one of the many vocalists that contributed their lungs for the guitarist’s 2010 eponymous solo album. Slash said he became aware of Kennedy when the singer was asked to audition for the now-defunct Velvet Revolver. While Kennedy initially declined the offer to audition for Velvet Revolver, the singer consented to contribute his talents to Slash’s debut album when asked (which, in addition to Kennedy, also featured an impressive and vast array of vocalists such as Ian Astbury, Ozzy Osbourne, Chris Cornell and Lemmy Kilmister). Slash eventually found himself asking Kennedy to join him on tour to promote the album. The tour was so successful that Kennedy became a permanent fixture, handling all the vocal chores on Slash’s second release, Apocalyptic Love. Feigning an innocent look, one hesitates but asks how the guitarist has handled the inevitable comparisons between Kennedy and Rose, especially since Kennedy has more than ably handled the Guns N’ Roses songs. Letting out something between a groan and a laugh, Slash good-naturedly looks over this forbidden journalistic faux pas and gives an indirect answer. 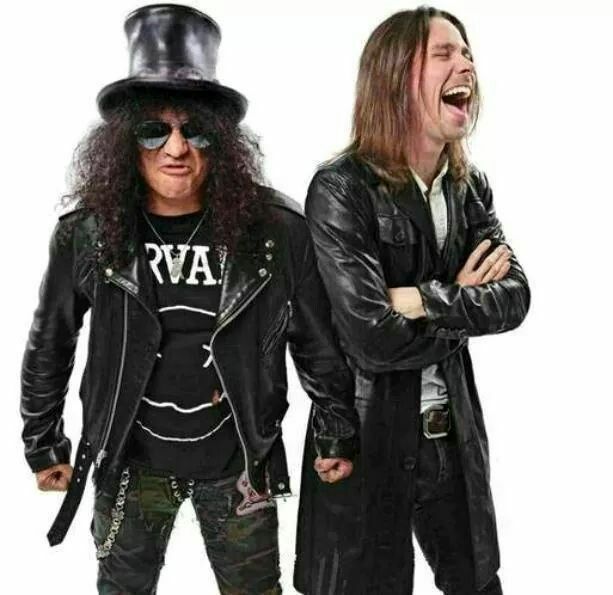 Throw in bassist Todd Kerns, drummer Brent Fitz, and touring rhythm guitarist Frank Sidoris and you have a band that Slash is happy with and one that maybe has the longest names in history – Slash: Featuring Myles Kennedy and the Conspirators. According to the guitarist, it wasn’t supposed to be that way. 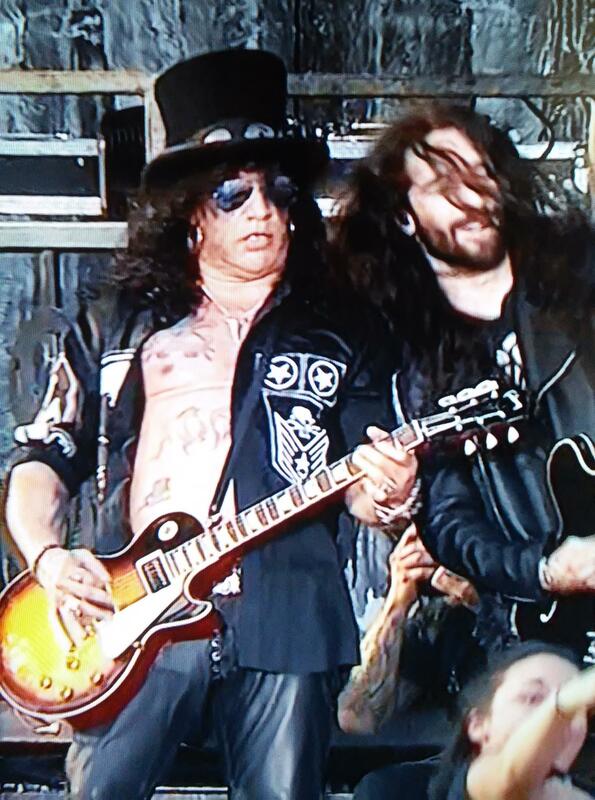 Supporting his musicians aside, Slash has also been an ardent partisan of horror films. Via the guitarist’s company, Slasher Films, Nothing Left to Fear was released in 2013. With music by Slash and featuring actress Ann Heche, the story revolves around a pastor and his family moving to Kansas and encountering malevolent forces. The company’s latest production, The Hell Within, is slated to begin production in early 2016, with Slash recently launching a fan-backed crowdfundung campaign for the project. Back to the music business, Slash – along with Kennedy and the Conspirators – have constantly been writing on the road for the fourth album. The band has plans to continue touring until the end of December, with plans to release its fourth album sometime in 2016. Interestingly enough, Kennedy’s band, the previously mentioned Alter Bridge, is supposedly going to release another widely-anticipated album in 2016. Does Slash feel any sense of foreboding to this? The guitarist, who turned 50 this year, believes he has a lot more to explore in life. While groaning at the “50 is the new 30 concept,” Slash said he is looking forward to many more years of creating whatever stimulates his senses.